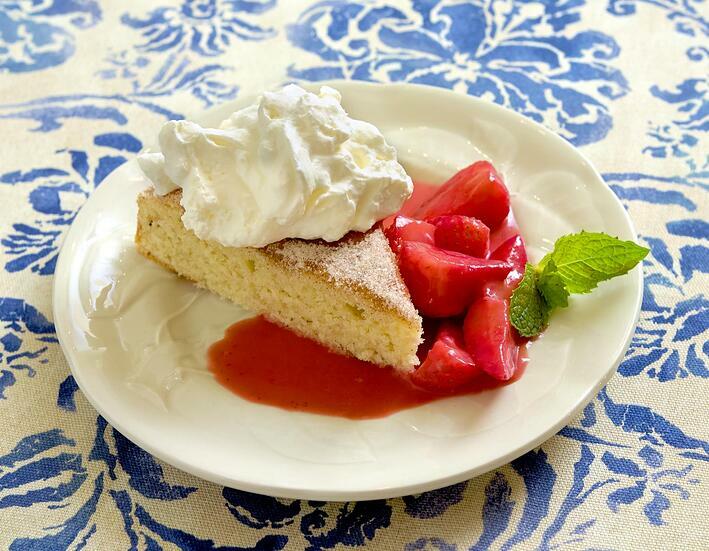 This scrumptious spice cake uses extra virgin olive oil for a rich depth of flavor, and the strawberry sauce is made with fresh strawberries and regular olive oil so that the Grand Marnier can really shine! Preheat oven to 350. Brush a 10” cake pan with extra virgin olive oil (or olive oil) and flour the pan. In a small bowl combine flour, baking powder, salt and nutmeg. Mix by hand and reserve. In a larger bowl combine extra virgin olive oil, sugar, egg, buttermilk and apple sauce. Stir the reserved dry ingredients into the wet mixture just until batter is formed. Transfer the batter with a rubber spatula to the prepared cake pan. Top evenly with sugar and cinnamon mixture and bake for about 20 - 25 minutes, or until a toothpick inserted in the center comes out clean. Allow to cool to room temperature. Run a paring knife around the edge to loosen. Flip onto a plate. If needed, warm the back of the cake pan with a blow torch until the cake flips out. Flip cake back over and cut into 12 pieces. Take 1 pound of strawberries and the sugar, olive oil, and Grand Marnier and place in a large sauce pot over high heat until the sugar dissolves. Remove from heat and puree. Strain the puree through a fine strainer to remove the seeds. Chill the puree. Before serving, add the other pound of cut strawberries to the strained puree. Spoon 1 to 2 ounces of strawberry sauce on each plate. Sprinkle powdered sugar on top of the slice of cake and place on top of the sauce. Garnish with whipped cream and mint.